Western Pacific Skipjack Tuna: Is it Overfished? You heard it from Beel first. The western Pacific skipjack tuna Katsuwonus pelamis is being overfished. And this is a bit of a feat says Beel, because the skipjack matures early (age 1), grows rapidly, and is a prolific breeder- even without Viagra. It’s all there in black and white, and color, in a report titled, “Tuna Fisheries Status and Management in the Western and Central Pacific Ocean,” produced by the Western and Central Pacific Fisheries Commission. You can get your copy here: report source. This is bureaucratese. Let’s look at their data, their figures. Catches in the Western Pacific tuna fishery, showing the species caught and the areas in which they are captured. The larger the circle, the greater the catch. (source) Click to figure enlarge. Okay, first, the skipjack tuna is productive, so it is perhaps not surprising that it is the most commonly captured fish in this area. 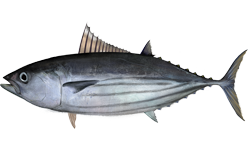 The skipjack tuna is a surface fish, which makes it susceptible to purse seining. This practice uses long, deep nets that literally encircle entire schools for harvest. It’s the perfect gear for catching skipjack tuna. Purse-seine catches in the Western Pacific fishery. (source) Click figure to enlarge. 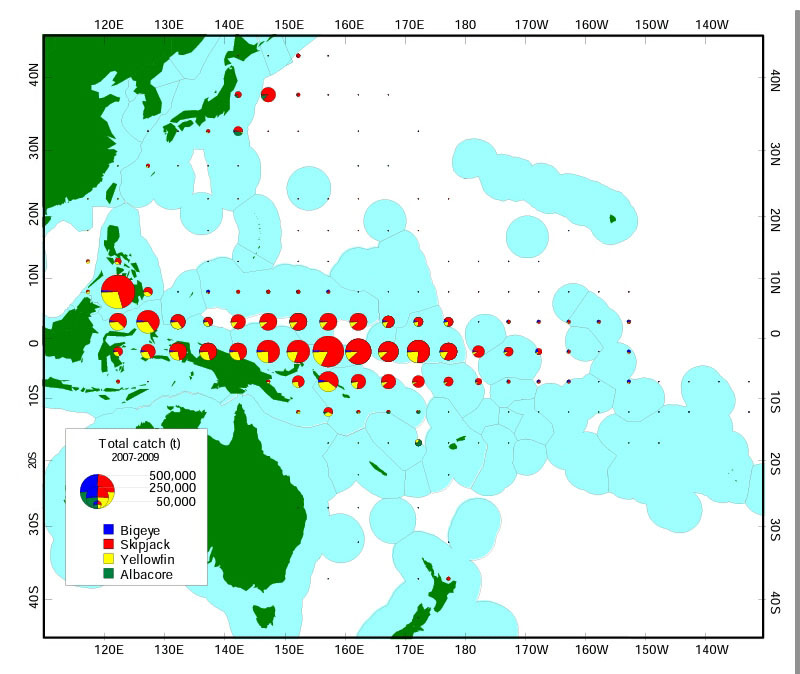 Harvest of skipjack tuna from the Western Pacific was relatively small until recently. Then the purse-seine fishery took off. 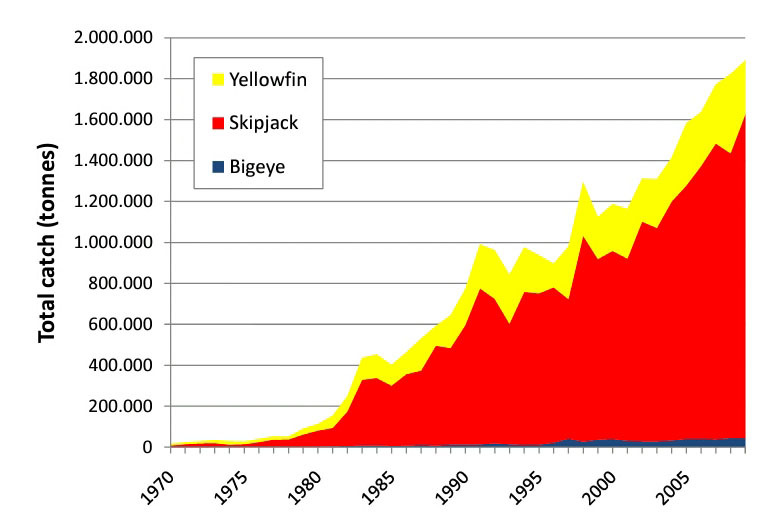 Friends, you can see the rapid and substantial increase in catches of skipjack tuna in the figure above. Every year, the catch is greater. More fishing, more harvest, more canned tuna fish! C’mon, do you think it’ll go on like this forever? The fishermen do. They always do! And the Western and Central Pacific Fisheries Commission wants to pretend it will, else they’ll have to stand up to the mean ol’ fishermen. Now, the really important graph, which does not copy well (it was low quality in the report). Beel has presented these kinds of figures before. Please allow Beel to present a brief description. Think of tuna biomass as money in the bank that you are drawing interest off. Think of fishing as spending. So, in the green square you are spending interest only and at a rate that does not result in overspending (drawing down the principle). Currently, the skipjack tuna fishery is the green (see the bureaucratese above). However, in the past several years there is a clear tendency- shown by the red arrow added by Beel- toward overspending (interest + principle) such that soon we will be living off the principle- and not the interest-we’ll be in the yellow zone above. We’re in deficient spending: spending (harvesting) more than we (the tuna) are making. Eventually, the tuna stock will be drawn down low enough that current harvest cannot be maintained (the bureaucratese quoted above acknowledges this, but only after blowing off any potential problem). It’s time to act now. The referenced report includes catch data only through 2011. By the time this year’s assessment, with data through 2012, is available we’ll have followed the trajectory of the red arrow for two more years (2012 & 2013). The fishermen are harvesting skipjack tuna to beat all hell. As stocks begin to decline, the Western and Central Pacific Fisheries Commission may try to grow a pair, but they’ll allow themselves to be beat back by the fishermen who will claim they’re catching more tuna than ever so there can’t be a problem. Well, sure they’re catching more and more fish. 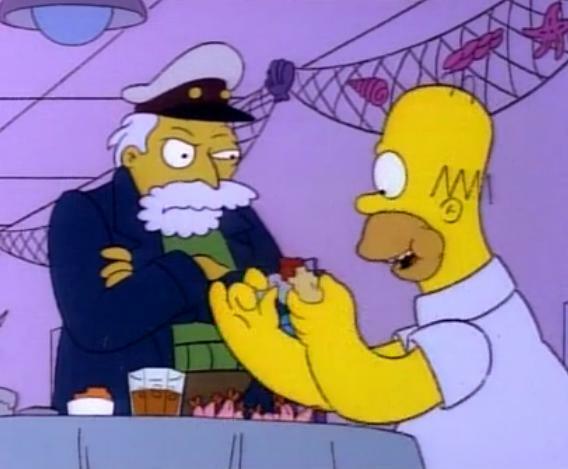 They’re squandering our biological inheritance like a bunch of drunken fraternity boys. Mr. Fisherman, please don’t catch too many of those skipjack tuna thingies. When the you-know-what hits the fan, the Western and Central Pacific Fisheries Commission will have to do something. Everyone will be upset, the fishermen, the public, even Beel. This happens every time. Every time. You just can’t slow the fishermen down before they overfish the stock, that would make too much sense. Please friends, Beel asks that you look at the graphs: do you think skipjack tuna catches are going to increase forever? 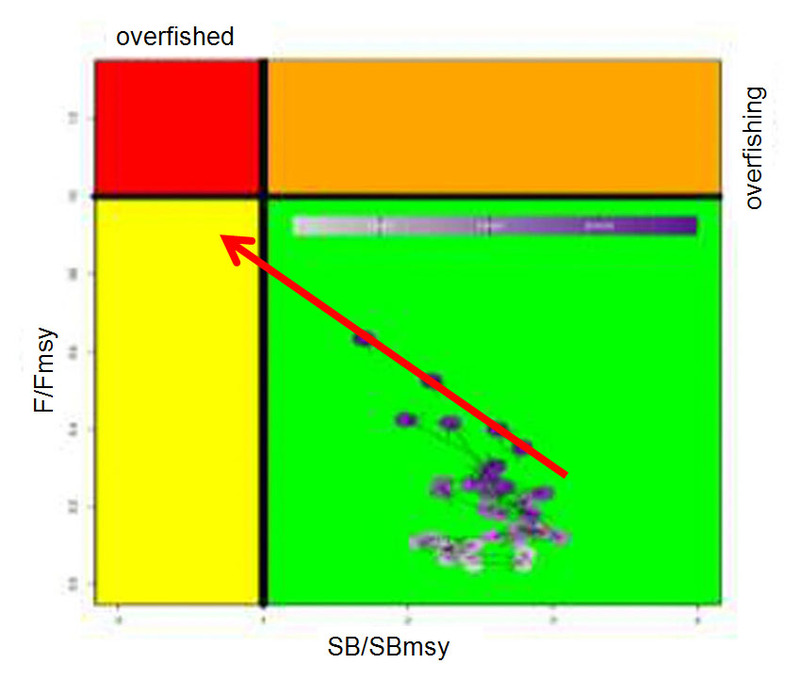 Look what our tuna managers say: “…fishery impacts are moderate and the stock is neither over-fished nor is it experiencing over-fishing.” This just means the dots in the last graph, above, are all in the green area. Think it’s going to stay that way? Again, look at their graph. This entry was posted on February 4, 2013 by denstormer in Commentary, Conservation, Fishing and angling and tagged fishery management, marine fish, overexploitation.